CodeTwo Exchange Sync is Shipping! A couple of weeks ago we announced that the works on the new CodeTwo Exchange Sync are underway. And here it is. CodeTwo Exchange Sync is now shipping. CodeTwo Exchange Sync is the successor of CodeTwo Folder Sync, The latest release has not only got a new name but loads of new features too. It is a program for Exchange administrators who would like to effortlessly synchronize data between folders of Exchange. For example, CodeTwo Exchange Sync will let them automatically synchronize data between selected folders. Interestingly, the application allows synchronizing data from public folders to mobile devices (PDA, BlackBerry) – a feature pursued by many companies. In One-to-One Synchronization two folders will take part. The data is pulled from one source folder and replicates to one target folder. Whereas, in One-to-Many Synchronization, you can choose only one folder that will act as the source of items, and multiple target folders that will receive updates to the items from the source folder. Many-to-One Synchronization reverses this logic and enables choosing multiple source folders, while the destination folder is only one. In One-Way Synchronization the user is furnished with additional features that can be used in syncing items, such as filters and modifiers. The former are used to sift the items in the source folder(s) before syncing to replicate to the target folder only those items that match the defined criteria. It is very convenient if you do not want to copy all items from a folder indiscriminately. The job of modifiers, on the other hand, is to tag the synchronized items on-the-fly according to the user’s design. For example, you can have all items undergoing the sync be marked with a color category so that they stand out in the target folder and are easily singled out. Next, the application features the subject modifier that will append extra information to the items’ subject e.g. the item will end up in the target folder with the item’s owner’s name in front of its original subject. But One-Way Synchronization is not all that the application handles. There is the Two-Way Synchronization that enables synchronizing items in both directions. 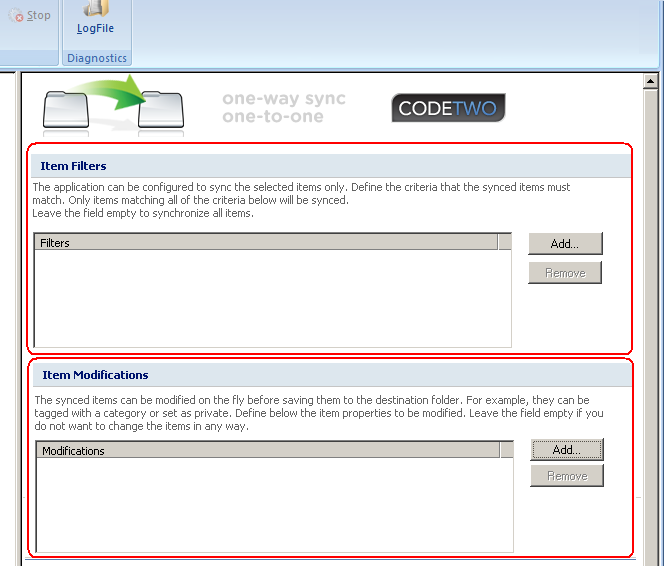 No matter in which folder the change is made to the item, this version will replicate to all other folders included in this synchronization task. If the number of folders participating in the Two-Way Sync is greater than two, they form the so-called Folder Ring. Like in our other applications (CodeTwo Public Folders to give an example), CodeTwo Exchange Sync too supports real time synchronization. All the syncing of items takes place immediately with no retention period and in the background transparently to the user. This means each user can enjoy updated data in his/her folders at all times. The application can be downloaded and used freely for 30 days as a fully functional evaluation copy. Once the demo expires, it will ask you to activate and here’s another novelty. CodeTwo Exchange Sync features the automatic activation module like all our recent releases(e.g. CodeTwo Exchange Rules and CodeTwo Exchange Rules 2007). This makes going to full version so much easier. You do not need to reinstall the application when you want to activate because the License Key you are provided upon completing your order will be used to unlock the trial version. A major benefit of CodeTwo Exchange Sync is that it does not need to be installed directly on the machine equipped with Exchange server 2007 / 2003 / 2000. You can install the application on another server or even a workstation. Finally, some great news for user of the previous version 1.0 named CodeTwo Folder Sync. You get the new version absolutely free of charge. All you need to do is contact our Sales team. This looks great. I’ve got to get this on my blackberry.